Being physically active is very important to help you control your blood glucose. You can jog, walk, bike ride, dance, swim or whatever other workout you feel comfortable doing! Every week, you should aim for 150 minutes of physical activity. This can be broken down into 30 minutes every day for 5 days a week. If you are diabetic and take insulin please check your blood glucose before exercising to avoid low blood glucose. Consult with your doctor before starting a new exercise routine. 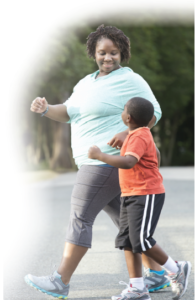 If you have questions about managing your exercise routine and insulin regimen please speak to your doctor. One great way to be active is to walk. Move as often as possible!